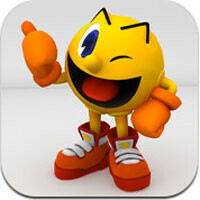 Namco Bandai Games has just released PAC-MANGAMES to the App Store. This release includes 6 classics with added support for today’s social competitor. The titles included are PAC-MAN S, Galaga S, DigDug S, Rally-X S, GATOR PANIC S, and PAC-CHAIN S.
Namco Bandai has used the powers of Facebook Connect to allow players to link their games to Facebook. This allows you to challenge your Facebook friends as well as other players worldwide. PAC-MANGAMES features customizations that allow you to create your own avatar, room and world, and of course, post photos of it to Facebook. While the game does use Facebook for sharing scores and tracking leaderboards, it does not allow play between Facebook and iOS devices. The games are the originals, but redesigned into a timed Score Attack mode. Rather than working off of a lives system, like the classics, PAC-MANGAMES offers short timed bursts of play, which is more suited for a mobile experience. PAC-MANGAMES is available for both iPhone and iPad for $2.99. Unfortunately, it does not work with the iPhone 3G or iPod touch 1st and 2nd-generation devices. Unless they include a pair of binoculars (to better see that teeny-tiny screen), the games are useless. And, no iPhone 3G or iTouch compatibilty = iFragmentAtion. Available on Android Q4 2014! Available on Android years ago without rooting with emulators! FOR FREE!!! !